Prof. Alan Dershowitz’ term for the false accusations that Israel killed a Gazan child emphasizes how the media gloss over those murdered in the Sbarro pizzeria, Maalot, the Fogel and Hatuel families, and other Jewish children. “Layla al Ghandour is the face of the massacre in Gaza”, titled al Jazeera, inflaming the anger of the Arab-Islamic world. The photo of the eight-month-old Palestinian girl who died on May 14 at the border with Israel immediately made the rounds of all the Western media, including Italy’s largest newspaper, Il Corriere della Sera, which printed her photo on the front page. “A child from Gaza dies, a symbol is born” the New York Timesreported. “Mother cradles baby killed by Israeli soldiers”, the Daily Mailheadlined. Then Gaza’s Ministry of Health under the leadership of Hamas said that it had removed the girl’s name from the list of people killed in clashes with Israeli troops. It is the same ministry that, a week earlier, had said that Layla had “died from inhalation of tear gas”. The ministry spokesman, Dr Ashraf al Qidra, said that an investigation was carried out and that “Layla al Ghandour is not listed among the martyrs”. But the newspapers were excited by the blood and the dead, they didn’t have any criticism for those Palestinian parents who brought the children to a fight where they knew that there will be tear gas and the smoke of burnt tires. For them there is never a Caravaggio. The next World Press Photo award is ready for Haitham Imad, the photographer who has immortalized Layla in her mother’s arms. “There is a war and we are not even on the battlefield” Michael Oren, an Israeli deputy minister for diplomacy, said a few days ago about the media. Journalism played a central role in the attack on Israel’s legitimate right to defend its counters and citizens. Giulio Meotti The writer, an Italian journalist with Il Foglio, writes a twice-weekly column for Arutz Sheva. 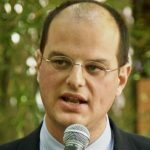 He is the author of the book “A New Shoah”, that researched the personal stories of Israel’s terror victims, published by Encounter and of “J’Accuse: the Vatican Against Israel” published by Mantua Books.. His writing has appeared in publications, such as the Wall Street Journal, Frontpage and Commentary.